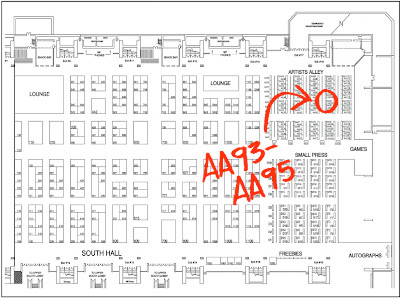 Later this week, February 22-24 I will be attending Wondercon at the Moscone Center in San Francisco. I'll be sharing space with the very talented Bobby Chiu and Kei Acedera at one of the Imaginism Studios tables in artist alley. AA93-95 to be precise. I'll have plenty of Belle du Jour on hand so stop on by. I thought I'd share some of the dedication drawings I did while I was in Angoulême. Some in Belle Du Jour, some in Rex Steele. Thanks to everybody who sent me scans, I appreciate it. 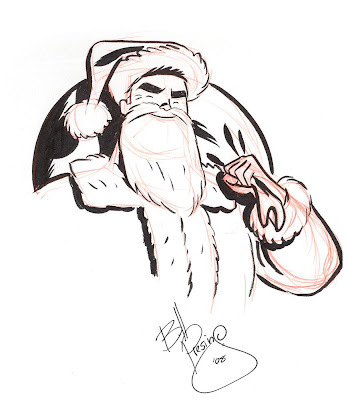 Rex Steele as Santa Claus was a bit of an odd request, but there's something about it that makes a weird kind of sense to me. 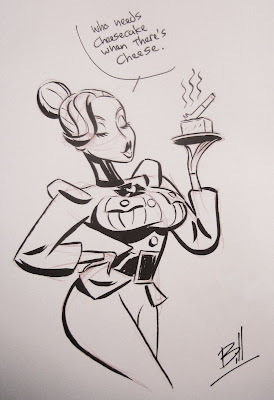 I may want to put together a book of convention sketches someday. 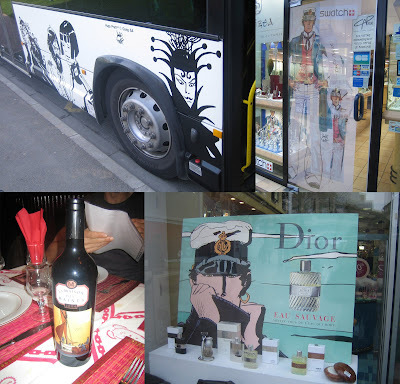 I have to say my time in France was amazing. Ted Mathot and I had a fantastic experience, very transformative, makes me seriously consider making BD full time. We made great friends ate great food and bought a lot of great comics (maybe too many). This is Richard and Emmanuel (aka Akileos) our gracious publishers, not to mention our gracious hosts for the trip. They were a pleasure to work with and I hope to make many more books with them. 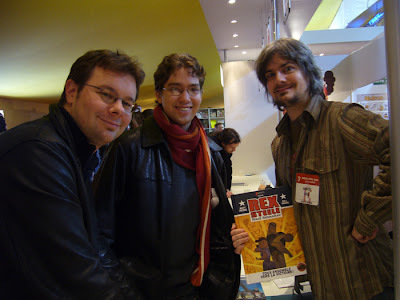 Our first signing was at Album Bercy in Paris, where we met Charles (not pictured) who was our friendliest and biggest fan of the trip. This is dinner after the show. 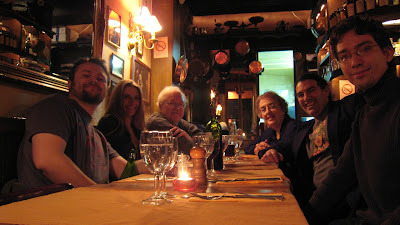 That's Dean and Barbara Yeagle seated at the far end there, Diane and Jean-Jaques seated across from each other at middle table position, foremost on the left is Charly (designer of the Raving Rabbids in the Rayman games), and me on the right. 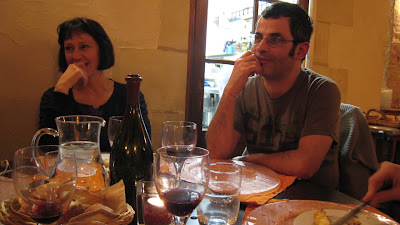 This is Christopher and Brigitte, We met them in Tours. 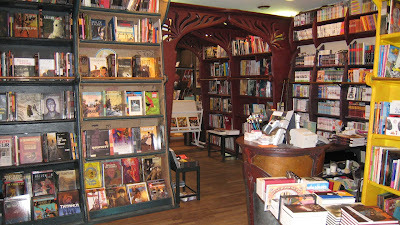 Brigitte is the owner of Bédélire books, the awesome shop where we had our second signing. I have to admit I didn't know what to make of Christopher when we first met him. 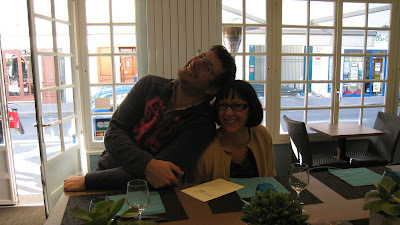 He and Brigitte greeted us at the train station, Christopher translated for us, then showed us around Tours. He was quite the "tour(s)" guide with an extremely impressive knowledge of the history of this very old city. So I think to myself, who the heck is this guy? 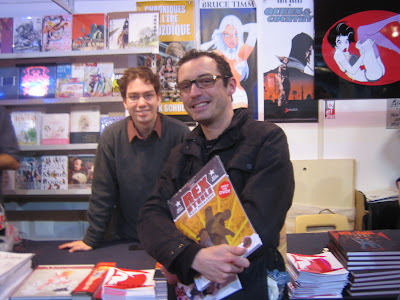 Over the course of the day I slowly discover he's a very talented and amazingly prolific comic book artist who lives quite an enviable lifestyle of making comics there in Tours. This is Bédélire in all its glory. 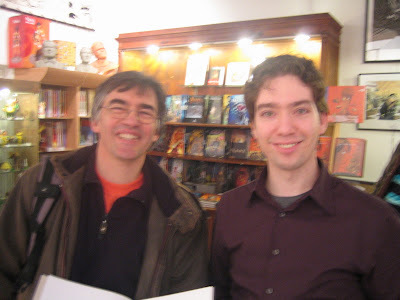 Here are Ted and I signing at Bédélire. 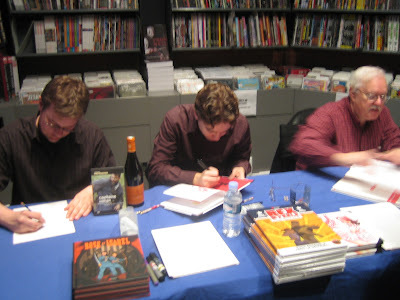 I was signing a book for the fine gentleman pictured above when I discovered that he is none other than Jean Barbaud! Who draws the best cartoon airplanes you will ever see!! And inspired my own airplane drawing (although mine are far lesser). Not only that, but he worked on Inspector Gadget! My brain imploded. 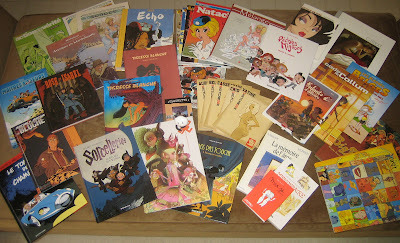 While in Tour we got to meet many great artists (as there is a very large number of comic books artists who live there). 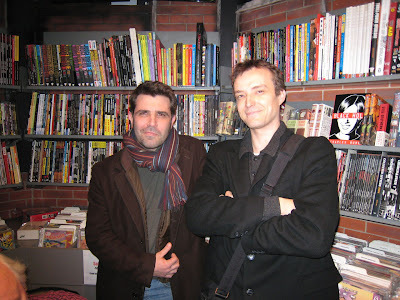 Philippe Larbrier (pictured right) was one of 'em. 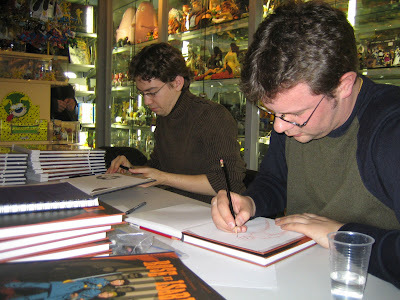 He's one of only three people licensed to draw Disney comics in France. 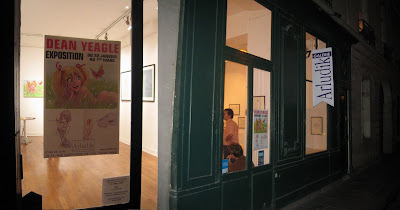 Then, to Angoulême! The festival inhabited the entire town, every where you looked were comics. 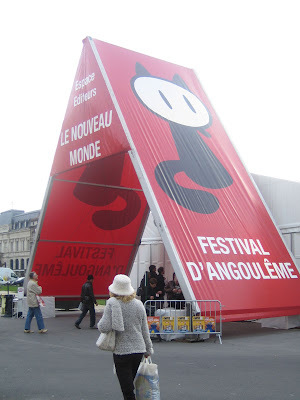 And not just the Festival tents, in the town and on the streets as well, even make-up stores sold comic books, it was crazy! 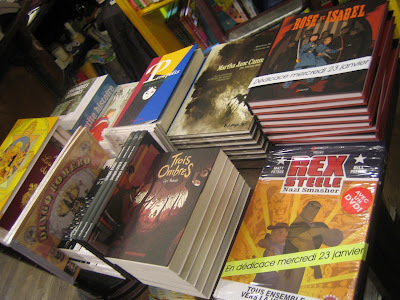 To me European comics though I love them are considered pretty obscure here in the US, so it was pretty shocking for me to see this stuff in the commercial mainstream. 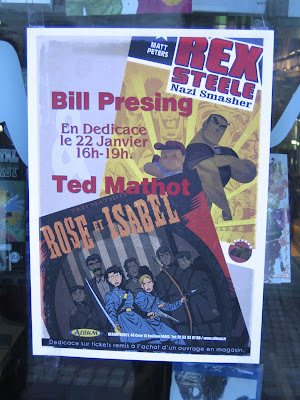 For instance Hugo Pratt art was everywhere! On busses. On Wine. On watches. On perfume?! This is where Ted, Dean and I signed at the Akileos table. 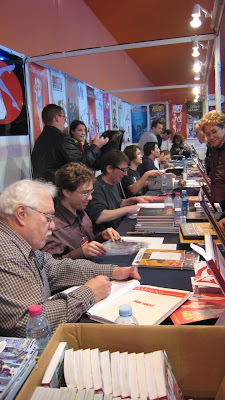 The etiquette in France when you sign is to do a complete drawing (or "dédicace"), which is very uncommon here in the US conventions where most would charge for such a thing. Ted, dean and I were very grateful for getting to draw many dédicaces. Here's a signing Arthur had at a lingerie store. How cool is that? Ted and I with Bannister, another awesome French artist known in the states from his "Flight" work. 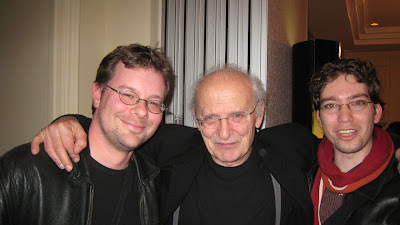 Ted and I with Jean Moebius Giraud! 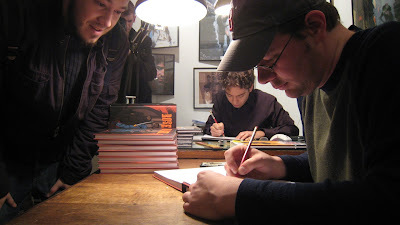 I don't even care if my mouth is open in this picture, it's Moebius! Many many thanks to Nick Parry-Jones for introducing us. 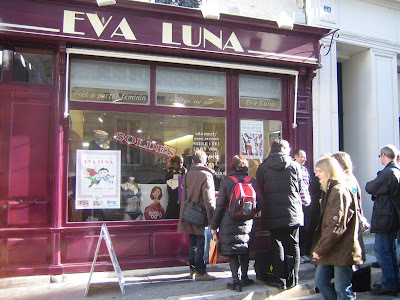 After all that excitement it was back to Paris for one last signing at Album Comics on Saint-Germain. The one that sells the import American stuff. Then finally back home with all the goodies I got. I would like to thank everyone who promoted and made this trip possible for us, and to everyone who came by to see our books. No one could have been friendlier. Thank you.